"We negotiated with the terrorists for six hours, but began the storm when we heard gunshots from the prosecutor's office," said Istanbul's security chief, Selami Altınok. Kiraz was taken hostage by the Revolutionary People's Liberation Party-Front (DHKP/C) on Tuesday afternoon. The official gained public notoriety leading the case of Berkin Elvan, a 15-year-old protester who suffered injuries during the anti-government demonstrations of 2013. Elvan fell into a coma for nine months, and died in March last year. He has subsequently become a symbolic figure for the street protest movement. DHKP/C posted an image on Kiraz on Twitter, with a gun to his head, followed by a list of demands. Among them a public "apology" and a "people's trial" for the officer accused of injuring Elvan, pardons for all who have protested in his name, and safe passage out of the court building. 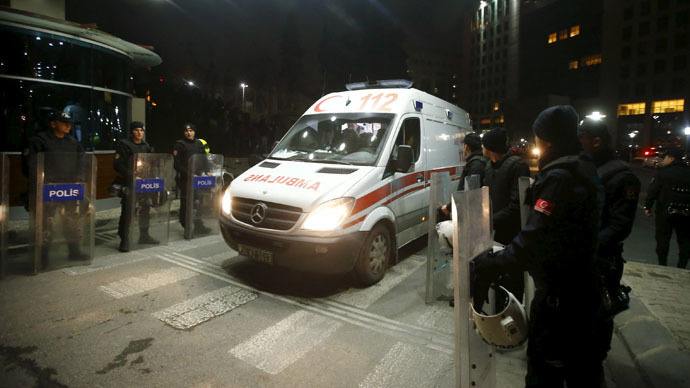 But as the three-hour deadline set by the hostage-takers expired with no resolution, the Turkish forces evacuated all people from the courthouse, and snipers took up positions in nearby buildings. Local media reported that Sami Elvan, the father of the dead teenager, made a plea for the armed men to give themselves up. "My son is dead, and the official must be released," he reportedly told local media, though to no avail. DHKP/C is a Marxist-Leninist outfit, founded in 1978. It’s responsible for a number of assassinations and suicide bombings, and is considered a terrorist group in Turkey, the United States, and the European Union. On September 10, 2001, it killed three people in a suicide bombing. Spontaneous, localized demonstrations in support of Berkin Elvan began after the siege ended, with police using water cannons and tear gas to disperse the protests.